The 8ftx 6ft Shiplap Reverse Apex Shed is accessed via a braced single door, positioned along the side panel of the building. 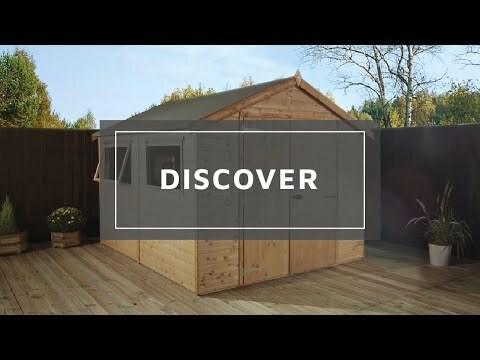 Ideal for most garden sizes and layouts, this spacious shed offers plenty of space to store away all your gardening equipment, tools and bicycles. A large window allows natural light to filter into the shed and is made from shatterproof styrene. A safer alternative than traditional glass, making this shed ideal for busy gardens or allotments. Made from 12mm interlocking shiplap tongue and groove boards and solid sheet board to the floor and roof. Quality sand felt is supplied to protect the garden building against weather damage and a pad bolt will keep your items secure. Our Reply:Good morningThank you for taking time to leave your feedback, it is great to hear that you are happy with your purchase. Thank you for leaving your feedback. We do take all points, negative or positive seriously and your comments regarding your purchase will be passed through to the correct department for them to look at and see if there are ways to rectify this situation. Thank you for letting us know your building is great quality! Review:Excellent shed for the price, much better than a more expensive alternative I was considering. Reasonably easy to put together but would recommend avoiding it and paying for assembly if you've the money to spare. Thank you very much for your great review, I hope you enjoy your new building for many years to come. Our Reply:Brilliant!! Thank you for the fantastic feedback!